The Alaska Department of Transportation & Public Facilities (DOT&PF), in cooperation with the Alaska Division of the Federal Highway Administration (FHWA), has initiated preliminary engineering on a project to upgrade the intersection of the Steese Expressway and the Johansen Expressway located in Fairbanks, Alaska. Thanks to all who attended our open house on December 6, 2018, took our online survey, and provided comments. We are currently working on summarizing and responding to the comments received. The purpose of the Steese Expressway/Johansen Expressway Interchange is to enhance motorized and non-motorized mobility and user safety at the Steese Expressway and Johansen Expressway intersection and within the influence area of the intersection. The Steese and Johansen Expressways are principal arterials in Fairbanks, AK, and the intersection is ranked in the top 10 for entering vehicle volume in Fairbanks. The Steese/Johansen intersection is a critical node for commercial traffic heading to the North Slope from Canada, Valdez, and Anchorage. The area surrounding the intersection has seen substantial commercial and residential development since the early 2000’s when the Bentley Trust area along the Johansen Expressway began to be developed. Traffic volumes on the Johansen increased by 27% with the opening of Walmart and Fred Meyer’s, and intersection volume increased by 45% between 2004 and 2007 when the area was rapidly developing. Following the initial spike in traffic, total intersection volumes have increased at an average rate of 1% per year (2007-2016). 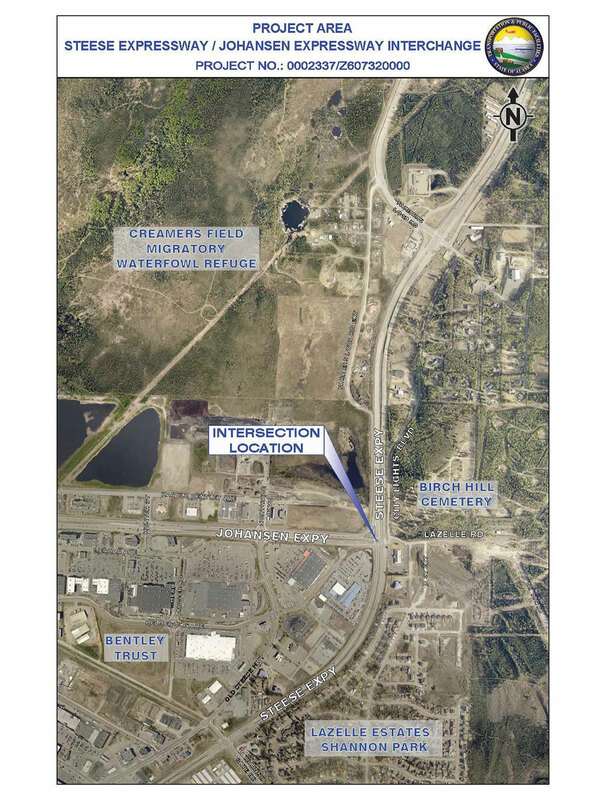 Residential development has been predominantly driven by military growth associated with the adjacent U.S. Army Garrison Fort Wainwright. Pedestrian and Bicycle Safety: Long crossing lengths and high speed (55 mph or greater) vehicular traffic through the intersection increase the risk of severe pedestrian and bicycle crashes. Two pedestrian crashes have occurred in the past 10 years (2005-2014) crossing Steese Expressway, with one resulting in a pedestrian fatality and the other resulting in a major injury. Residences on the east and the commercial district on the west create a high crossing demand. Pedestrian Delay: Pedestrian delay exceeds desirable delay standards during peak traffic hours (Level of Service [LOS] E). Proximity of Farmers Loop Road: The proximity of the Farmers Loop Road intersection creates additional delay during peak hours. Southbound Steese: Steese traffic exiting at the Johansen conflicts with entering Farmers Loop traffic, with conflicts highest during AM peak. Eastbound Johansen: Johansen traffic desiring to turn at Farmer’s Loop utilizes the left-most turn lane, unbalancing the lanes and reducing the signal capacity. Queues can back traffic up to the Old Steese intersection. Northbound Steese: Traffic on the Steese desiring to turn at Farmer’s Loop utilize the left-most through lane, blocking the westbound left turn pocket during the PM peak, reducing signal capacity. Vehicle Delay: Eastbound left-turn vehicles currently experience an average delay of over 1 minute per vehicle in the PM peak (LOS E) and the total intersection LOS will be E in the peak hour by 2024 which is not acceptable by current design standards. This delay disproportionately impacts freight and transit vehicles and may impact air quality due to excessive idling. Preliminary engineering will run through June 2019. A preferred alternative will be identified for construction and appropriate environmental documentation will be prepared. The public is invited to provide comment throughout project development through public open house meetings and web-based surveys. Construction is not anticipated before 2022.